Ms. Celiac Says...: Cookies From Home! A few days ago, I arrived home to find a house-shaped box waiting for me at my door. To my surprise, it turned out to contain some delicious gluten free cookies in a red box wrapped with ribbon. I've tasted many different gluten free brands of cookies in the years I have been on this diet and there are definitely a fair amount of tasty ones on the market, but these are absolutely amazing! They taste just like the real thing! I actually had to double-check and make sure they were really gluten free! 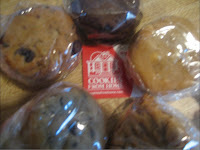 These yummy cookies are made by the brand, Cookies From Home, and they were kind enough to send me their "Check Me Out Sampler" so I was able to try all of their varieties of gluten free cookies. I loved each and every one of them, especially the Mac the Nut! Cookies From Home sells other cookies besides their gluten free ones. When you go to their website, make sure you look for the Gluten Free, Gracefully section! Please make sure to visit them at www.cookiesfromhome.com. You will be in for a real treat! There will be no post tomorrow (Thursday, October 1st), I will see you all on Friday!